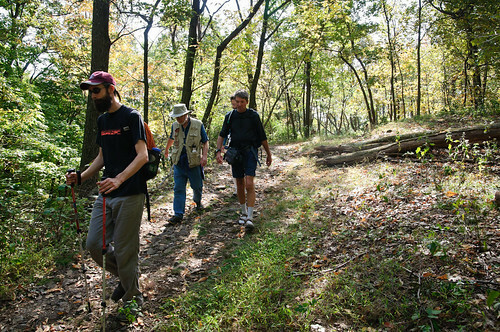 On Columbus Day, October 11, 2010 I had the pleasure (and minor pain) of hiking 33 miles of the Lenape Trail with a great group of people for an event organized by the Freewalkers. 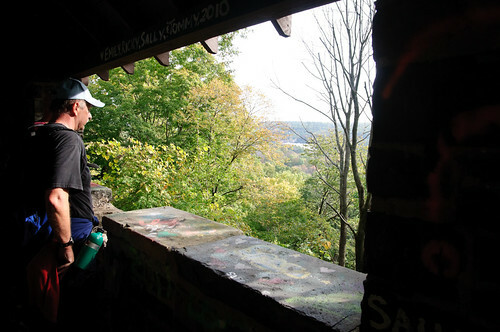 Starting from the southern tip of South Mountain Reservation in Millburn, the day long hike covered several suburban parks and hiking trails in Essex County connected by this branch of the yellow blazed Lenape Trail. It was a great day of walking, exploring the Essex County Parks system, and getting to know a bunch of new friends and fellow hikers. I thought the trail was great and was really quite surprised that the route consisted of so much time spent on trails—straight through from Hilltop Reservation to Mills Reservation—rather then the massive concrete pounding I was expecting. I know some others let out cheers of joy each time we found sidewalks or asphalt paths, but I prefer the dirt under my feet. If there is a repeat of the Lenape34 event I’m not sure I’d do it from end to end again, but the walk certainly opened my eyes to a few little parks and spots, such as the West Essex Trail and Cedar Grove that I’m eager to spend some more time exploring. 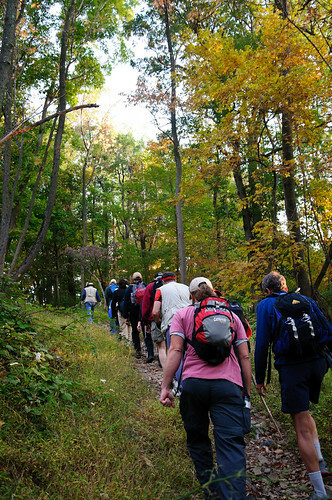 The Lenape Trail starts at the Locust Grove parking lot at the Millburn end of South Mountain Reservation and heads north through the park up, straight up to the ridge and then across past Hemlock Falls, over South Orange Ave and Cherry Lane and then continues through two other segments of the park. This was by far the most lengthy “hiking” like portion of the trail for the day, and the cool air and just starting to turn trees made a great spot for the group to start (and the most photogenic scenes for the day). After exiting the park the yellow blazes take a path through that forks—with a western spur heading out towards Roseland, Livingston and eventually Morris County, and an “eastern” spur going north a bit more over Rt. 280, and then behind West Orange High School, eventually leading up the hill our lunch spot and then to Eagle Rock Reservation. At right about the 10 mile mark we entered Eagle Rock Reservation, where the trail then skirts through the park, hitting the highest elevation of the day, a few photo ops, and some great walking through the quiet woods and basalt rocks. 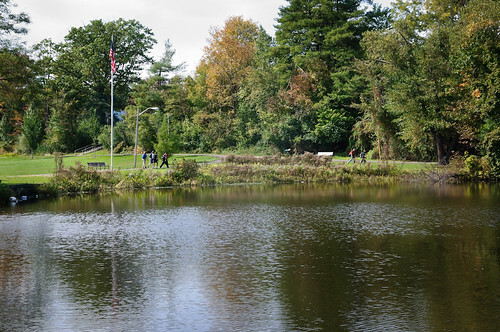 Next on the tour of parks, after winding through some sleepy little side streets in town, was Verona Park where the trail circles around the boat house and the lovely pond and out onto Bloomfield Avenue. After Verona park we hit the sidewalks again for just a short while. We then skirted Hilltop Reservation and stated onto our longest stretch of continuous unpaved trail. Can’t say much about the park as it felt like the trail we were on just passed behind some houses and under the “hill” to come out and cross over to the start of the West Essex Trail. Here I have to admit, the one park I wanted to explore more of, having only been through there briefly in the past, the group I was with somehow skirted part of the trail and must have taken a shortcut. Still, it was a well paced walk around the reservoir on our way to a well deserved break on the other side at the Mountain Ave train station. From Mountain Ave it was a bit of asphalt pounding right through the 20 mile mark until we started passing through some of the more conventional local parks that comprised the rest of the day. First we hit a small park and pond that acted as a little oasis (construction aside) and onto Brookdale itself where we all paused and regrouped (or shuffled groups) for the final push ahead. And where we got passed on the track around the park by a bunch of high school runners making me feel like we were going all that much slower. The Sidewalks of Nutley, et. al. From Brookdale Park it was the longest stretch of street walking of the day, over the Garden State Parkway, through a few back alleys and utility roads and small parks on the way to Newark’s famous Branch Brook Park. Miles 22 to 27 were not anywhere near the most interesting stretch of the day, but allowed for some chit chatting among the group that left Brookdale together. 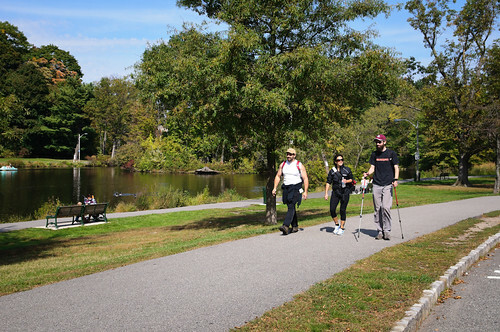 By the time we hit Belleville Park and the norther end of Branch Brook Park we were losing light fast and the group of hikers I had settled in with were thinking about the possible ways we might finish the day. 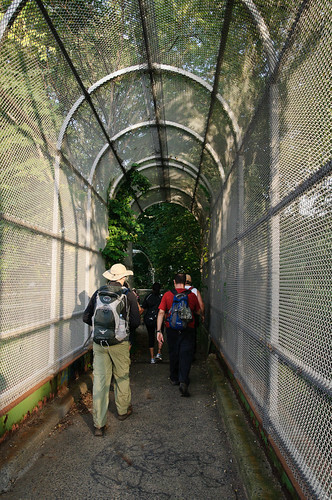 Because of the light and the end of the day approaching we didn’t get to “see” much of Branch Brook as we pushed forward to the light rail station to make the final decision on how to finish the remaining 4 or 5 miles through to Newark Penn Station. We decided to press on to the finish line, but cut around the rest of the park and along the road through the dark. We couldn’t have asked for better weather throughout the day, but it wasn’t 15 minutes of walking after leaving the Branch Brook Park light rail station when that caught up to us with a vengeance. First a mile or so of walking in the rain had us all thoroughly soaked. Followed by a drop in temp of probably 10 or 15 degrees and a freak hail storm pounding us as we passed Broad Street Station forced us to take cover in a building lobby just minutes from our final destination. By this time not only was everyone tired the temp drop pretty much did us all in and had us just wanting to be done and home. In the end the group I was with on and off all day—John, Lynn, Ian, and Maurice—made it to Penn Station Newark together and on the feet we started the journey with. When all was said and done, and even with the two or three deviations from the “official” yellow blazes, we covered 33 miles of trails and streets of suburban New Jersey. 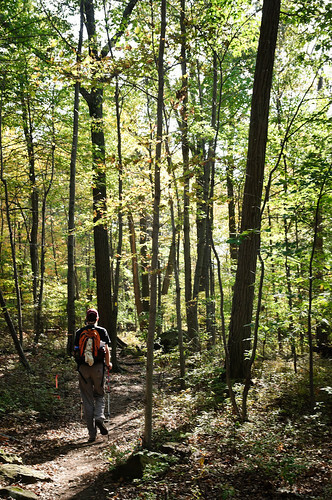 The Lenape Trail is part of the Liberty Water Gap Trail connecting Liberty State Park and The Delaware Water Gap. 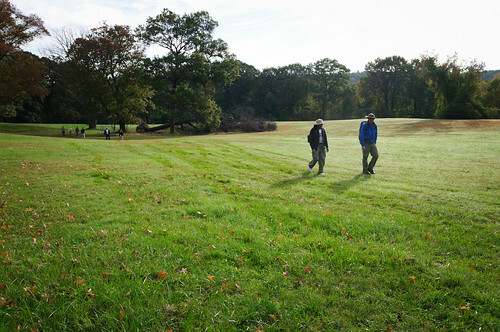 Official information can be found at http://www.libertygap.org and http://www.libertygap.org/lenape-trail.html. The Lenape34 event was organized by the Freewalkers who also organized the 50 mile Big Walk event last spring. Their site is at http://freewalkers.org/ and they’re on twitter at @freewalkers. Leading up to the hike Jen Connic, editor at Millburn Patch, wrote Lenape 34 Hike to Raise Trail Awareness covering the event and some of the backstory and history of the Lenape Trail and the Freewalkers event. Event participant, Nutley Resident, and one of the hikers I crossed the “finish line” into Penn Station with, Jon Demmer has a great story up with his experiences from the walk on the Freewalkers site in WHAT A CRAZY NIGHT!!!. Prints of my photo of the the yellow Lenape Trail trail marker are available for sale. This entry was posted in Trip Report and tagged branch brook park, eagle rock reservation, Essex County, freewalkers, hiking, hilltop reservation, lenape trail, liberty water gap trail, mills reservation, nj, south mountain reservation, walking, west essex trail. Bookmark the permalink.